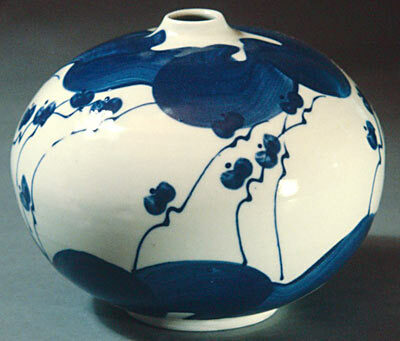 Round Porcelain Bottle with blossoms and waves in Georgian Bay color pattern. It is 7" tall and 7" wide. This bottle can be ordered in Copper Harbor, Iron Mountain of Lake Superior. Its catalog number is V3 and its cost is $65. 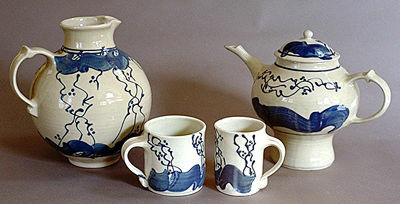 Collection of pieces in the Georgian Bay color pattern on porcelain. From left to right: Large Pitcher, 9" tall, 4 qt. 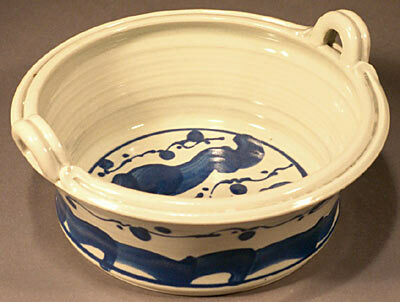 capacity, $70, (P2); Regular Straight Mug 12-14 oz. capacity, $22, (M2); Small Straight Mug. 8-9 oz. capacity, $18, (M1); Large Tea Pot, 9" tall, 1 _ qt. capacity, $95, (T2). All are dishwasher safe. They all are food safe for hot or cold beverages. They are also available in Copper Harbor, Iron Mountain and Lake Superior. 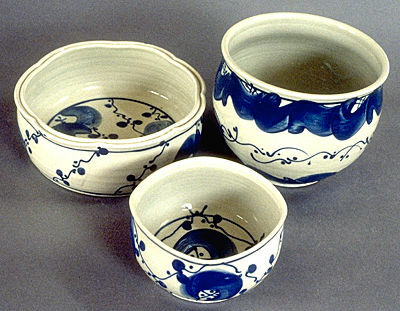 Collection of Porcelain Bowls in the Georgian Bay color pattern. From left to right: Fluted bowl with split rim, 12" wide, 5" tall, $48, (B4); Small squared bowl, 6" wide 4" tall, $30, (B7) ; Large Cache Pot 9" wide and 8" tall, $40, (B3). Dishwasher safe. Also available in Copper Harbor, Iron Mountain and Lake Superior. Porcelain Serving Pan with split rim and handles in Georgian Bay color pattern. This piece is useful for serving or display. It is 10" wide and 4" tall, costs $70, and has a catalog number of B11. It is also available in all the other color choices.